South Africa 287 and 4-71 (Hashim Amla 41, AB de Villiers 16*, Mitchell Johnson 2-31) trails Australia 7-494 declared and 5-303 declared (David Warner 145, Chris Rogers 39, Kyle Abbott 3-61) by 440 runs with six wickets still in hand. The first innings of Australia was declared at 7-494 and again took a chance by declaring 5-303 in 58 overs. The home side was sent back to the pavilion for 287 in the first and they were reeling at 4-71 after 41 overs in the second innings. The fourth day’s play finished on Tuesday, March 4, 2014 at Newlands, Cape Town. Earlier, the Aussies commenced their second innings at 27 in six overs without losing any wickets whereas David Warner and Chris Rogers were batting at 25 and 1. The duo went after the rival bowlers from the word go and the first attained his fifty on the 41st ball. The opening partnership was dislodged at 123 when Rogers was run out for 39 runs and was replaced by Alan Doolan. The run rate was kept high by the two batsmen and the boundaries were flowing from their willows frequently. The score was enhanced to 188 when Doolan was gone for 37 as Shane Watson appeared in the center. David Warner blasted his consecutive hundred of the match in the 47th over and decided to punish the home bowlers. 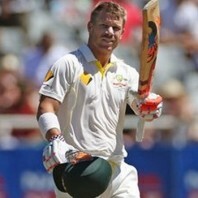 Watson became the next victim for 25 and Warner was caught behind by AB de Villiers off Kyle Abbott for 145. Steven Smith and Brad Haddin were at the crease for 36 and 3 when Michael Clarke declared the second innings at 303 for the loss of five wickets in 58 overs. Kyle Abbott was the top wicket taker with three and Morne Morkel got one. South Africa required 511 runs to win the match in the possible 142 overs with plenty of time left in the game. They had a miserable beginning when Alviro Petersen was declared leg before wicket off Ryan Harris. Their skipper, Graeme Smith, was gone for just five runs in his final international match and Dean Elgar was clean bowled by Mitchell Johnson for a duck. The Proteas were in dismal position at 3-15 when Hashim Amla and AB de Villiers added 53 runs for the fourth wicket. Amla was held lbw off James Pattinson for 41 as Kyle Abbott got together with de Villiers. The pair was at the wicket for 1 and 16 at the close of the play as their team reached 4-71 in 41 overs. 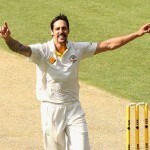 Mitchell Johnson was the supreme bowler with two wickets whereas Ryan Harris and James Pattinson shared one each. Australia is in a commanding position since South Africa needs another 440 runs to win the encounter with just six wickets remaining.